AC Schnitzer BMW i8 has released details of its latest tuned BMW, the AC Schnitzer BMW i8, which comes with a number of performance tweaks over the standard i8. 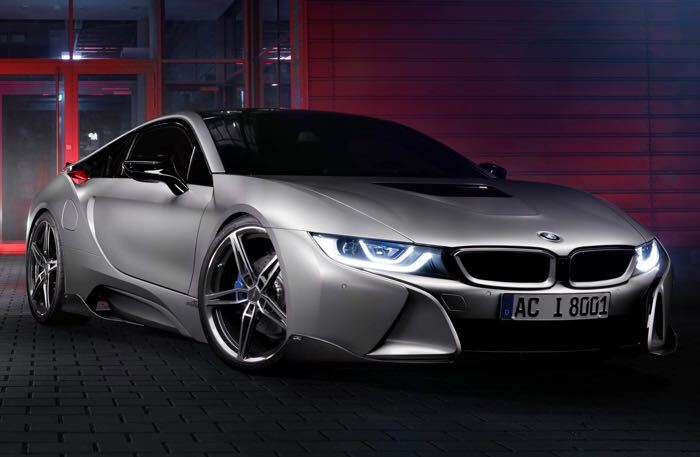 The AC Schnitzer BMW i8 gets a set of 21 inch forged alloys, as well as a number of carbon fiber enhancements and much more. Lowered by 25 mm at the front and 20 mm at the rear, the i8 by AC Schnitzer hugs the tarmac more closely than the standard vehicle and can therefore develop maximum efficiency and dynamics on the road. AC Schnitzer carbon front spoiler elements, carbon side skirts (left and right) and a carbon rear wing also ensure that the driving pleasure can be fully enjoyed on acceleration from both the powerful petrol engine and from the electric motor. The AC Schnitzer logos on the vehicle sides show that the Aachen-based BMW tuning professionals have been at work here. The tuning specialists also have something up their sleeve for the wheelset of the BMW i8: the new AC1 forged alloys from AC Schnitzer are perfectly designed for the sports car, combining the hybrid look with a sporting design. With corresponding tyres and in BiColor, the new generation of wheels from Aachen perfectly suits the innovative plug-in hybrid from Munich – especially as it is available in any colour you want. You can find out more details about the AC Schnitzer BMW i8 at the link below, as yet there are no details on pricing.